Develop a protocol for determining the desired level of service and the required constraints. Develop an integrated model and efficient algorithms for large scale applications. Validate the model/algorithms and apply results to the state of Missouri. Most DOTs have multiple maintenance depots or sheds to provide public services such as winter snow removal, roadway striping, mowing, and herbicide application. The location of these sites has typically been based on geographical dispersion to provide the best coverage from a distance perspective. Each depot has a fleet of trucks to cover an assigned service sector. The location of depots as well as the fleet assignment is usually determined by the managers and engineers based on their experience, not on scientific evaluation processes. This research proposes, through systems analysis, to design a decision support system that provides DOT decision makers with efficient management tools for depot location and fleet assignment operations. 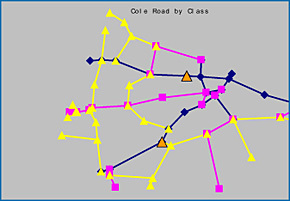 The decision support system will be able to evaluate any given scenarios and compute the optimal numbers of depots and trucks. These solutions can then be used directly or used as part of a decision support system for the asset management aspects of this important problem.